The default Deployments page displays the Deployments widget which provides a list of all deployments and enables you to create, update and delete deployments and execute workflows. You can list only deployments created basing on specific blueprint by selecting the blueprint from Resource Filter widget below Create Deployment button. You can also use Search input inside Deployments widget to filter deployments list. Each deployment in the list includes details about the attached blueprint, when the deployment was created (if it was updated icon indicating that will be shown near creation date) and the nodes on which it is deployed. 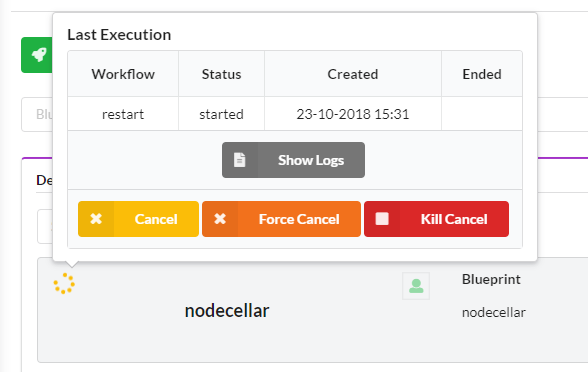 You can also quickly check status and logs of the last workflow executed on the deployment by hovering over the status icon in the top left corner of deployment. Depending on the type of the execution there are additional action buttons there. Select a blueprint from the dropdown list. Specify the deployment inputs for the blueprint or use the defaults. The deployment is added to the list. When you click on a deployment in the list, a deployment-specific page opens that, by default, displays the following widgets. You can also execute workflows, update or delete deployment from this page. More about widgets listed above you can find in Default Widgets Reference. Each of the actions are described in detail here. Click the action you want to perform (eg. Install, Uninstall, Scale, …). Provide values for workflow parameters. Select the blueprint for the updated deployment. Select the inputs file for the blueprint or provide values for the inputs. Set actions to be performed during the update or use defaults. For more information about updating a deployment, click here. For more information about creating custom workflows, click here. When prompted to verify that you want to remove the deployment, click Yes.